Home / Latest TBV News / Victorian breeders join together in a Divine celebration! Victorian breeders join together in a Divine celebration! 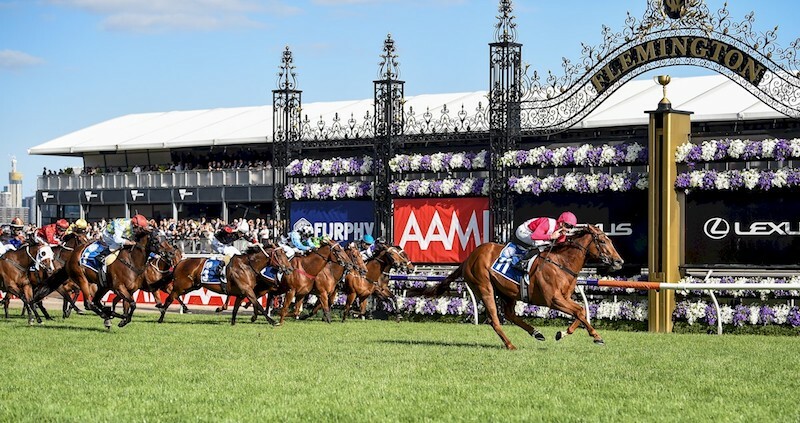 Boutique breeder and successful racehorse owner Jeffrey Dimery of Macedon’s Uluru Stud was thrilled when on one of racings biggest days, his homebred filly Divine Quality blitzed the field in the Group 3 Furphy Sprint down the Flemington straight. Guided by her regular jockey, Beau Mertens she lived up to her name with a dazzling performance to come from last to win, going away by three and a-quarter lengths to deliver the perfect finish to a day at headquarters for her trainer Robbie Griffiths. As Dimery unfortunately, dispersed the majority of his outstanding breeding stock at the Magic Millions National Broodmare and Weanling Sale, the highly promising Divine Quality, was sold as a yearling and now races for another successful Victorian breeder in Princeton Stud’s Craig and Kathleen Pearce, located on the Mornington Peninsula. A daughter of Darley’s stallion Sepoy, who stands at Victoria’s Northwood Park, Divine Quality’s win was particularly exciting for Dimery being one of the first horses he had ever bred, out of one of the first horses he ever raced in Nun Faster. Nun Faster showed exceptional talent early in her career for her trainer Danny O’Brien, who was a half-sister to the triple New Zealand Group 1 winner King’s Chapel (NZ), who also ran second in the Group 1 George Main Stakes. Divine Quality is a half-sister to Melbourne stakes winner Vatican. “She was a very talented mare showing great ability. She won her first start impressively, ran in the Danehill Stakes at her third start, but unfortunately developed a leg infection and had to be retired,” Dimery said. He was over the moon for Robbie Griffiths and the Pearce’s who purchased Divine Quality for $185,000 at the 2015 Gold Coast Magic Millions Yearling Sale through Woodside Park Stud’s draft. “We had looked at quite a few Sepoys and they were out of our price range, but we saw her at the 2015 Gold Coast Magic Millions Yearling Sale and were fortunate to pick her up for $185,000,” Pearce reveals. Additionally, Dimery has a nice connection with the current owners Craig and Kath Pearce of Princeton Stud, with the Pearce’s being the lucky new owners of his original mare Nun Faster. “We were thrilled to pick up Divine Quality’s mum, Nun Faster for $180,000 at last year’s Magic Millions National Broodmare Sale,” Pearce reveals. Princeton Stud, a 55-acre property at Moorooduc in Victoria, commenced operations in 2007 and currently plays host to twelve mares, while the Pearce’s also have ten racehorses in work carrying their distinctive racing colours of hot pink and white crossed sashes. “We’ve had a handful of stakes winners in recent years with The Quarterback being the best of them so far, but I’ve always felt that Divine Quality is Group 1 quality and hopefully she’ll prove it in the next twelve months,” Pearce adds. “As for the breeding side, we’ve got a dozen babies on the ground and there will be about eight yearlings heading to sales in 2019,” Pearce reveals. While Dimery still has a strong link to the family, and will continue enjoying the ride. “I keep some of my horses with breakers Ray and Sandra Matthews, along with my spellers at Danny O’Brien’s property at Barwon Heads who I also raced the Group 1 winner Shamexpress with and Da Little Engine. We had great fun with him, and now his little sister appropriately called De Little Sister looks like she has some upside too,” Dimery said.